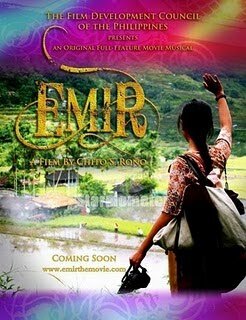 "Emir" touts to be the first-ever Filipino musical film. This came as a surprise to us as Filipino films (from the 80s and 90s) always had the fun yet comical song and dance number. There was always time for people to dance on the beach or on the pool especially when the film had a romantic or comedic theme. If you believe "Slumdog Millionaire" had the best dance numbers then maybe you should think again. What excites us about "Emir" though is not it being a first but for it being totally different from what we usually see from a local film. Its topic is serious and relevant plus it exudes an epic feel. To be frank, it has been a long time since we felt this way for a local movie. "Emir" also tries to break into a market filled with films that are either about love or about just being plain funny. It is taking a huge risk by trying an untested package and presentation. Can it bring its game on? Read on to find out. "Emir" is all about Amelia (Frenscheska Farr). Amelia hails from Ilocos and she is forced to find work abroad to provide for her family. Amelia leaves her family and everything she loves behind. Amelia applies as a nanny and is lucky enough to be the caretaker of the Sheik's pregnant wife. Later on, Amelia is given appointed nanny of the Sheik's first born son Ahmed. Through the years, Amelia will not only see Ahmed grow to a boy but she will also learn more about life's trials and tribulations, struggles of lonely worker in a foreign country. "Emir" more than mystified us with its grandeur, scope and especially its storyline. No, it is not a perfect film but it is definitely worth a second look. The musical elements is the movie were brilliant. The songs were well-written and well versed, something that our Filipino culture can be proud of. The songs never felt out-of-place and they reflected the tone and nature of the scene showing on screen. The film's cinematic quality was superb. Some scenes even looked like they were grabbed from Hollywood films. We are not exaggerating here - you have to see it to believe it. As for the story, we believe it was beautifully crafted. Some may argue though that it was predictable and too optimistic to reflect real-life. The scenes on the first few minutes of the film were a little confusing as well, making us feel a bit lost. Frencheska Farr did very well as Amelia. We couldn't believe that this is her first acting stint as she came off as someone really experienced. Her voice was really good and we won't doubt that more success will come her way after "Emir". The supporting casts played their parts well also. The film finally needed more polish in terms of lip syncing on some scenes but we are nitpicking here for sure. "Emir" is a film Filipinos should be proud of. It shows a clear reflection of the lives of OFWs and what they are doing for the country and for their loved ones. It is sad that people will have a hard time finding a cinema showing the film. How we wished it was widely-released and marketed better because this is definitely a game changer.